This is the first time i ever had ayam penyet. Heard about this particularly famous Indonesian import since last year but never really had the chance to try it. Well my chance arrived a couple of weeks ago after me & some friends landed home from our holidays. 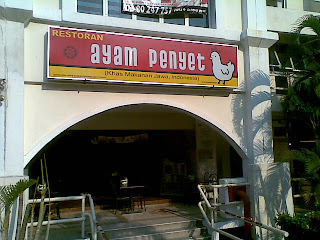 This place that we decided to go to is Restaurant Ayam Penyet, located in USJ 9 or Taipan Business Centre. It was covered on The Star and some other magazines and recommended highly by one of my friends, so off we went straight from the airport. 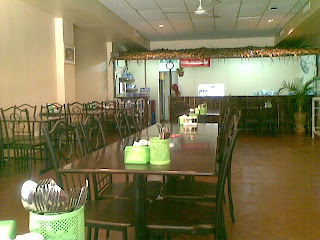 The restaurant is located on the ground floor, with its big & very visible signboard. Dont be fooled by the interior shot. It was 3pm at the time and we were the only customers. 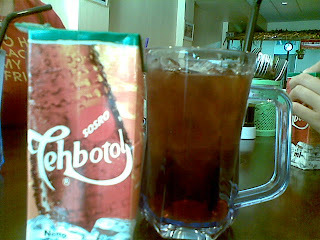 We started the meal with a nice cooling Indonesian tea called Teh Botol. Taste lighter than our usual teh-o-ais, which is what we really needed on that hot sunny afternoon. 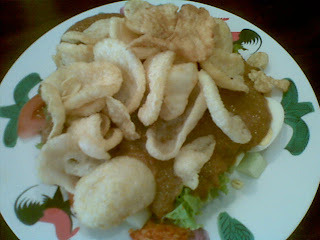 We had the Gado Gado for starters, a salad dish with lettuce, tomatoes, bean sprouts & eggs covered with mystery sauce which taste like a gentle version of satay sauce and topped with some prawn crackers & interestingly, brinjal crackers. Certainly tasted very very nice, just enough to warm up our stomachs for the big ayam penyet meals ahead. 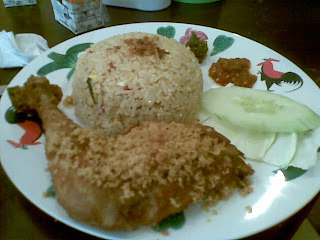 All of us ordered the same ayam penyet with nasi goreng meal. Were told that this is the best combination in the house. The chicken was very aromatic and the meat, very juicy & tender, cooked just right. Spices used on the ayam was spot on, not too overpowering like the ones you get in KFC haha just enough to bring the best out of the ayams...perfect! The nasi goreng complimented the ayam perfectly, Would really say this is one dish i dont mind coming back again & again for lunch. One thing to add. 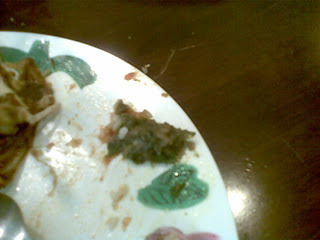 For those to cannot take the heat...stay AWAY from their sambal & balachan. these are from Indon and trust me, you'll either enjoy the hotness, or cough like hell. I thought it was some pickled veg so i put the whole thing into my mouth, almost died lolz. this is NOT pickled veg...its dynamite! Heres a map and contact details for you readers. Coming from Digital Mall Usj 19 along Jalan Kewajipan, turn left into Taipan Business Centre after you see the big mosque. look for USJ 9/5Q. It should be on your left on the 1-way street. Lots of parking there. Hours: 8am - 10pm daily, closed on Sundays. Doggyjames says...Very good even for a poultry fan such as myself. Nice neighbourhood kinda restaurant and the pricing seems quite fair. You should have a go at it, you'll definitely fall in love, i know i did. OHHHHHHHHHHH, so this is the restaurant my sister talking about.